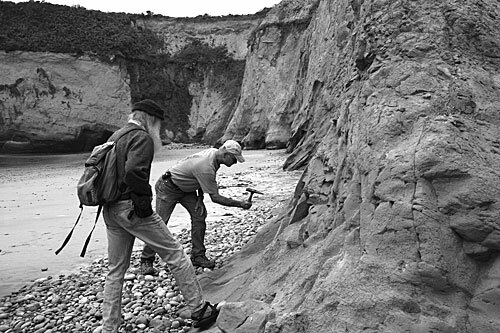 Geologist Jerry Weber cracks open secrets of Año Nuevo's cliffs while Peter Scott watches. Northern elephant seals may be the stars of Año Nuevo State Reserve, but the area's landforms also rock. And while the ground usually creeps imperceptibly compared with marine mammals in a hurry to breed, it travels more energetically than you might think— sometimes with dramatic results. Sleuthing geologist Gerald "Jerry" Weber has been cracking open the stories in Año Nuevo's cliffs for more than 35 years. On Saturday, April 23, with a giant portfolio of maps and photos under his arm and a rock hammer protruding from his back pocket, Weber led two-dozen Club members and friends on a tour of the reserve's formations and faults. This stretch of southern San Mateo County's coast lies atop the boundary between two of the planet's great plates of moving crust. Here the North American and Pacific plates bump and slide horizontally past each other in a type of motion geologists call "strike-slip." When you stand at Año Nuevo Point on the western edge of the San Gregorio Fault Zone (a branch of the San Andreas Fault System), the land to the west of you— all the way to Japan— is moving to the northwest. If you then cross the San Andreas fault system and stand at Altamont Pass and look to the east, the area all the way to the middle of the Atlantic Ocean is moving to the southeast. Think about it this way: the rock you pick up on the beach at Año Nuevo Point may once have been in Mexico! The San Gregorio fault is active: it has been the site of major earthquakes, and it will give rise to more quakes in the future. But although Año Nuevo boasts one of the best-exposed major fault zones in North America, the fault's trace isn't as simple as a line in the sand. "From the moon it would look like a fine line," said Weber. "From here, it's a complex mess." Seismic fault zones consist of convoluted bands of jumbled rocks that may extend up to tens of miles across and contain crazed networks of fault lines, often buried under layers of sediment. If you don't look with an educated eye, you may miss something important. Indeed, in the late 1960s, geologists hired by Pacific Gas & Electric Company (PG&E) assessed the Coast Dairies property near Año Nuevo Point as a possible site for a nuclear power plant. Ignoring abundant clues that were later confirmed by Weber and numerous other experts, PG&E's consultants initially said there was no evidence of active faults near the power plant site at El Jarro Point. They were eventually forced to acknowledge undeniable evidence of an active seismic source within about 3000 feet of the proposed power plant site that— combined with rapid population growth in the Santa Cruz area— led to an abandonment of the North Coast site. 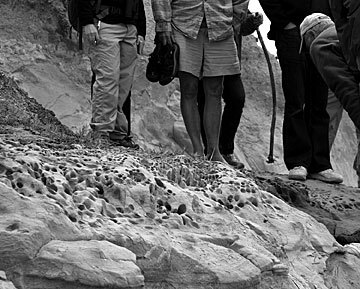 Hikers examine 105,000 year old animal borings on what was once the ocean floor..
As Weber led the group over beaches and dune fields, marine terraces and stream courses, he pointed out pieces of other geological puzzles he has worked on over the past few decades, including the rate of cliff erosion, the fate of migrating beach sands, and the visible imprints that millennia of human activity such as grazing and burning have left on the shape of the land. For all that geologists have pieced together about the history of Año Nuevo's wandering ground, though, Weber pointed out that in the context of geologic time, the vantage point of a few human life spans is too limited to reveal everything we might like to know about the region— including when and where the earth might next make a violent move. "A thousand years from now," he said, "we'll have a little better grasp of what's going on." That, too, should be an interesting time for a field trip.